On the prototype of an 8-speed automatic gearbox (8HP series) vibrations of the output side gear set were observed depending on the gear position. 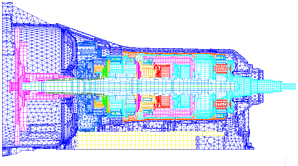 For investigating the causes of this behavior a dynamic FEA model of the gearbox was created, which is shown in the top figure. It contains the housing, the complete gear set, the kinematic couplings of the 4 planetary stages and the gear dependant couplings of the multi-plate clutches and brakes. As an example, the mid figure shows the FEA model of the 4th planetary stage with integrated plate carrier. A numerical modal analysis and a subsequent sensibility analysis regarding diverse excitations presented in detail the contributions of the kinematic compliances of the planetary stages, of the housing, of the input and the output shaft to the main mode shapes and the related resonances. 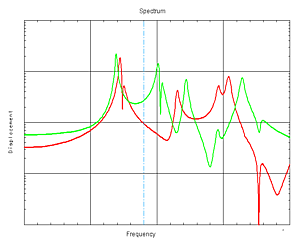 As an example, the bottom figure shows the vibration response of the hollow gear of the 4th gear set due to force excitation by the sun wheel of this gear set. Different coupling conditions at the journal bearings and multi-plate clutches were considered. The exact resonance point additionally depends on the outer boundary conditions of the gearbox housing, which differs significantly between vehicle and test stand. From the sensibility analysis, the required balance quality of the rotating gear set components can be determined. Finally, the dynamic model was applied for optimizing the structure borne noise behavior at the gear mesh frequencies of the diverse planetary gear sets. The components which are mainly responsible for the resonance behavior were identified and optimized. 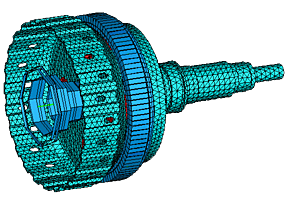 The influence of modified gear mesh sequences on the structure borne noise was investigated.